Transportation Costs > How Much Does a Bucket Truck Rental Cost? How Much Does a Bucket Truck Rental Cost? The bucket truck is a mobile working platform commonly used to maintain and install traffic lights, signs, telephone lines and cable lines. It can also help trim tall trees along the highways and other jobs that require aerial lifts. The cost of renting a bucket truck will depend on the truck you’re driving, the company, the working height, the geographical location and time you need it. The largest pricing factor, most of the time, will be the height limit. The higher its height limit is, the higher the price will probably be. Bucket trucks can offer aerial lifts that range from 34 to over 100 feet. On average, plan on budgeting at least $350 to $850 per day to rent a bucket truck. For instance, a 40-foot lift could be around $350 to $450 per day, while a 60-foot truck could be around $600 to $800 per day. As a rule of thumb, multiply the height by 10 and this is probably what you will have to spend at a minimum for the day. If you were to need it by the hour, then the costs could range from $75 to $250 per hour for an electric unit and up to $250+ per hour if you were to need an operator to help you with your project. The estimates mentioned above will include the truck rental only, similar to that of a moving truck. You will be responsible for additional insurance, an operator if required and gas/diesel. 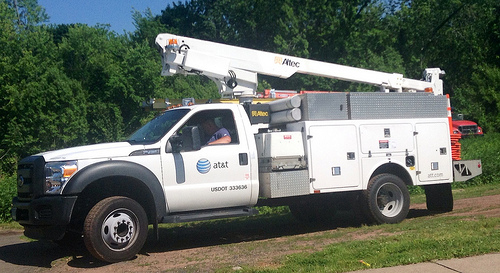 United Rentals, a popular nationwide rental company, offers a 41-49 foot boom lift truck for $463 per day or $3,474 per month. Most estimates won’t include the operator. If you were to need someone to operate the truck, then the hourly rates, depending on your geographical location, could start at $50 per hour. Delivery charges, if you needed the truck delivered to your site, could start at $200 to $300, depending on the distance traveled. Like a rental car, if you were to need insurance coverage, then this could be another $50 to $150+ per day and would only cover the truck. Larger trucks tend to be difficult to maneuver, especially in tighter spaces. To operate a bucket truck over 26,000 pounds, the driver must have a CDL in order to operate it. If it is less than 26,000, a standard class C is sufficient. As a safety measure, be sure to inspect the vehicle before using. This is important so that if something should break during the rental, you will not be blamed or be responsible for it. Be keen about hazards, leaks, and damage. If you were to hire an operator, many companies will have a minimum hourly requirement, which is usually around four to six hours. The longer you rent the truck, the cheaper the rates can be. Corporate rates are offered by some larger rental companies.